1. Heat the oil in a wok or a large frying pan. Add the red curry paste and fry gently for 2-3 minutes until the fragrance is beginning to rise. 2. Add about 100ml of the coconut milk and the chicken pieces. Stir fry for 3-4 minutes. Add the rest of the coconut milk, the fish sauce and the palm sugar. Bring to simmering point. 3. 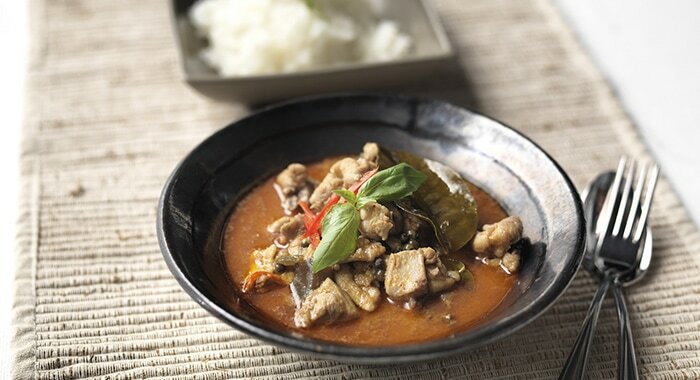 Slice the small Thai aubergines into six or cube the purple aubergine into 2cm pieces. Add to the wok with the kaffir lime leaves, sliced chilli and peppercorns. Continue to cook for 8-10 minutes until the chicken is cooked, the aubergines are tender and the sauce has reduced slightly. 4. Adjust the flavour with the lime juice and stir in the shredded Thai basil. Serve immediately.